Learn cohesion to previously unimaginable ways! MX and relaxing on the beach - the perfect combination! All dates and routes for Motocross in detail! Motocross, Enduro and Dirtbike riding is for everybody possible. Kids, girls and beginners can learn their first steps on a Dirtbike, as well advanced riders more difficult offroad skills. During the season we are almost ever day on a Motocross track or in the desert in Dubai for some Enduro riding, dunes bashing or a desert ride. We can rent you a professional riding equipment or you can bring your own gear with you. As well you can use your own bike or rent one of our fully Motocross competition Dirtbike /Motorbike. We can give you the best fitting programm for your skills and your individual convenience. We can make you a offer for a group of friends, you can join one of our groups or we can give you an exclusive offer for a private Motocross lession in Dubai or day with Arab Motocross and Motorbike Champion Mohammed Balooshi or 2 times European Champ Chris Moeckli. 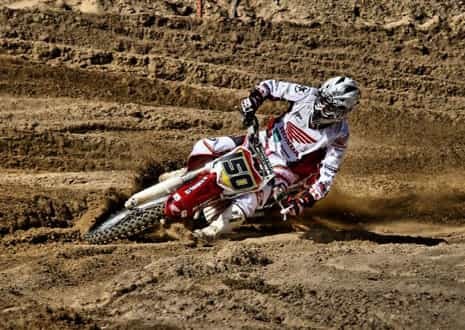 If you want to do a long term build up for a championship, we can as well do this for you and we will give you an offer for a several time practice with us, Motocross training schedule and physcial preparation. This can include basic MotoX skills like standing in right position, sitting on the right spot, braking and acceleration position, where to place the foots and weights on the footpegs, throttle control, all the jumping technics, like preload, scrubbing, controlling the bike in the air and a lot more. For more advanced riders we can as example teach you how to read a Dirtbike track, passing and defending the line skills, starting, how to get the holeshot, riding ruts and eyecontrol and we can make you a physical workout and coordination plan to improve fast on the Motorbike as well. For Enduro desert riding you need some offroad and Motocross experience first. For girls and kids we have a small bike and small equipment available. Most of our riders spend their first day on a Dirtbike, so dont worry if you have never been riding a Motorbike before. 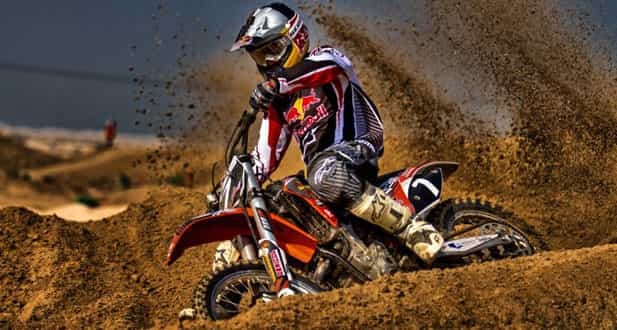 Professional Motocross riders will help you on your first steps on the bike. A lot of our participants will know already after the first day at our school the basic jumping technics and how to use it. Just send us an email an give us a call according questions or dates you would like to go riding your Dirtbike. On the phone we can give you all the informations as well in arabic. Book your Motocross, Dirtbike or desert ride today! Are you looking for a adventure or a challenge? Would you like to experience something different? Are you thinking about to make a child's dream come true? Do you want to improve your skills on a Motorbike? Do you like to spend a unforgottable day with your company or friends? Improving team spirit in your company? Are you playing with the thought to present someone an extraordinary gift? Is it one of your wishes to have a better and safer feeling on a motorbike, on- and offroad? Do you want to find out your limits? Do you have a kid who likes to ride a dirtbike? Are you a enduro rider who further wants to improve his riding skills? Are you feeling good to control and master an offroad bike? Want some flight lessions ?